SPOILER ALERT: This post contains spoilers to a handful of puzzles in the Sapienza, Marrakesh, Bangkok and Hokkaido scenarios. Porbably only the Hokkaido one towards the end is in any way major and it still leaves a lot to the player’s own imagination. Eh, you have been warned. A long time ago I wrote a somewhat strange post inspired by Dishono(u)red. I was trying to play it without quest markers because I found that they made me stop listening to NPCs and just move from marker to marker. This led to a situation where I couldn’t find an NPC i was supposed to be meeting with because all I had been told was to head back to HQ to meet him. DH HQ is a fairly large place so I wandered around hoping to spot him. After a long and futile search, I tried using my knowledge of the story to figure out where he might be and was rewarded. The sad man had sought solitude in a remote corner of the map. Bingo. This pleased me no end, being forced to use both brain halves and having to play ‘inside the story’. What’s the opposite of that thar ludo-narrative-disso thingy? Sadly, that was the high water mark of my anti-quest marker play. Mostly open world games, rpgs and the like are designed to work with quest markers. Sure NPCs will tell you to head somewhere and do something but to actually work out how that translates to in-game doings you are going to need the markers. At best you’ll flounder about in the general vicinity of your destination. At worst you’ll be completely mystified. I disabled Hitman’s opportunity system after ten minutes. The opportunity sytem is basically markers for optional quests. It alerts you to one specific path to take: Go here, do this and you’ll be on one of several ways to completing the mission. It’s not necessarily paint by numbers but it can be if you want it to. I never reenabled the opportunity system so everything that follows is based off of non-oppotunity system playthroughs. The genius of Hitman 2016 is basically that it allows you to opt for a version that’s more “show”, less “tell”. Sometimes it’s “showing” with exaggerated hints and nudges like a bad movie goer, elbowing you in the ribs during the early scenes of any horror movie to say “here’s some foreshadowing of bad things to come and no mistake”. Sometimes it manages to be subtle. Even in the former cases I think it’s a triumph. When you see an ancient cannon pointing at a golf course, you know what to do. When you see a wire-suspended, stuffed moose, you know that it’s intended to drop on somebody (I think somebody else has used it already but if not I wanna get in there: Chekhov’s moose, anybody? Eh? Eh? No?) But it’s still marginally showing-not-telling. It does not outright tell you to fire the cannon or drop the moose, it just dallies the target in front of the cannon. It just suspends the moose in the air above your target. And then an NPC asks you to go to the editing room. That has the moose winch in it. Coincidentally. The distinction between showing and telling isn’t a hard and fast one in creative writing and neither is it here. Say we wan’t to write a character as a villian. We can say that Charles is “an evil man” who does “bad things” or we can include scenes that induces a slight unease in the reader as to Charles’ character, like small unexplained actions or omissions, phrasings, gestures etc. But showing can also be extremely heavy handed, like having Charles enjoy stepping on cat’s tails and killing spiders leg-by-leg. Still, even when relying on tropes and clichés, showing tends to be better than telling, at least when the writer is aware of the trope. Let’s try this one on for size: In the Bangkok scenario, one target, a rock star, is secluded in a guarded wing of the hotel. When you first approach the stairs you will overhear the target’s manager instructing the two bodyguard only to let in 1) crew and 2) band members, with 3) kitchen staff as the sole exception to rule 1. If you approach the guards as X (X being neither 1, 2 or 3) they will tell you that X are not allowed. So even if you miss the scripted instruction you will be able to piece together the rule and the exception by observing who gets through and who get turned away. Here you are told exactly what goes and what doesn’t but you’re told so by an in-game character and you only have that information as a player if you caught it or have inferred it. The problem with telling (aka quest markers or the opportunity system) is partly that it takes away a lot of the creative challenge but also that it reinforces the separation of player and character. Your character know things you could have thought of but didn’t. While the game here could just as well tell you in it’s own voice (tooltips, popups, etc.) that you cannot pass those guards without a proper disguise, by letting Ms Barat inform you instead it helps in your identification with your character. If you didn’t catch it because you weren’t paying attention or were distracted, neither did 47. You are required to be present in the game world in order to play the game. Is 47 checking his phone while an NPC is talking? No? Then neither should you. You are required to be present in the game world in order to play the game. Is 47 checking his phone while an NPC is talking? No? Then neither should you. One more from Bangkok: There are several audio cues that inform you that the manager is to meet with a lawyer who happens to be your other target. In a room in the hotel you will overhear a conversation among the band’s crew informing you that one of the crew members have been charged with delivering a note to the lawyer informing him of where the meeting is to take place. It’s a horribly contrived piece of writing. The manager and the lawyer suposedly have each other’s phone numbers and in fact, the note tells the lawyer to go somewhere specific…. and call the manger from that location. So not one but two credulity straining attempts to turn a simple phone call in to a ‘moving bodies around on the map’ problem. Moving bodies around on the map is after all what the game mechanics rely on. Nevertheless, it does demonstrate what I’m talking about. Without the opportunity system you have to infer yourself 1) that one of the crew members is carrying the note 2) that you can take that note off of him and deliver it yourself (he has procrastinated so far) and 3) that setting up the meeting will cause the lawyer to deviate from his loop, probably opening up new possibilities. Is it Sherlock? Nope. But it requires you to pay attention and in paying attention you get a well balanced mixture of colour and atmosphere (what do the crew members think of the rock star and his manager), back story (who is this rock star) and thinly veiled hints (look at me, I’m carrying a note!). The components can tie nicely in to one another. Example: We simple, salt-of-the-earth folks down here in ‘e laundry room are not like silly rich guests who leave change and even keycards in their laundry… [lo and behold, a search of the laundry room yields up coins and a master keycard] … but we folks don’t have any use for that sort of things, right? haha! It’s not pretty but in my book it get a pass because it works. It ties the world and the game mechanics together. When the game came out it became commonplace to remark on the awfulness of the voice acting. Clearly British and American voice actors played everything from French fashionistas to Thai hotel staff, making no attempt to ‘do’ accents, dialects or sociolects. A supposedly working class Thai girl complains about her boyfriend in strict received pronouncation in the kind of screeching register worthy of a British aristostocrat. I agree that it’s pretty terrible to listen to but I think I understand the reason. You can use the same budget on quantity or quality and the choice of IO was for quantity. The same cast is used for each mission. That obviously means big savings over six separate casts. So what did they spend on? Presumably the amount of dialogue. Most players will notice the nice little contextually aware touches when NPCs comment on the player or their actions depending on getup. These are terrible quips written by writers desperate to find another way for an NPC to say “you’re a gardener” without having the license of children to simply state the obvious (source: I used to work in a kindergarten with kids who – to my endless amusement – felt the need to inform me that I had no hair). The interchangable lines in predetermined NPC exchanges are also quite pleasing: Players will hear a female mansion staff member telling her brother – ‘Rocco’ – to get dressed and come to work at the start of every Sapienza playthrough (starting on the town hall square) but for every line she has small variations so the dialogue won’t grate as much on the umpteenth restart. These add a little variety and flavour but to me, the main thing is the multiple little bits of information interjected into the background. Much of it smacks of exposition disguised as gossip – “My cousin who works for Rolling Stone told me Jordan Cross is a raving sporkophobe. Good thing I have my spork collection under lock and key which I have here in my breast pocket” – but it does wonders for making the the game playable without quest markers. They are basically an in-game heavy hint engine. At it’s worst it’s basically the same as the opportunity system, telling you to go pick up murder weapon. At it’s best you’ll need to piece together multiple bits of information and add a bit of intuition to make a solution. Take the ghost solution on Sapienza. Caruso can be convinced that he is being haunted by his mother’s ghost and basically knock himself out for you. To help you think of this solution the idea is hinted at in notes, which makes you start scanning the environment for ways to arrive at that. If you faulter along the way, the behaviour of Caruso at one stage in the setup helps you think of ways to take it to the next. This demonstrates a neat way that the tools, the environmental storytelling, and the NPC behaviour all work together. It also shows how Hitman helps the player arrive at a quite complex solution without needing to have it fully formed in advanced. The opposite of this is the absurd doodads that adventure games of old had you construct by mashing random objects together: Know what you need to accomplish and Hitman will help you get there, rather than punish you for not intuiting that wrist watch goes on top of the can opener which fits into the live tuna. My favourite example stems from Hokkaido and involves the series of actions needed to make Dr. Laurent do the work for you*. You need to obtain some information, and you need to find a way to present it to Laurent. I’ll admit that I stumbled upon both of these completely unaware of their existence. If you run with this you will turn the good doctor into Hamlet**, rambling about how he must avenge his dad but alas, cannot (you are the ghost in the machine and the ghost of Hamlet’s father, nice tie-in, IO). You then need to help disinhibit him a bit which will require observation and some deduction work all of which is helped by a large number of dialogue hints that manage skilfully to hint without giving away. The beauty of the solution is that this little substory of a doctor and his addiction is interesting in and of itself and some knowledge of the working conditions of pilots and surgeons and the sociocultural context of drug use is helpful in putting this together. Multistage puzzles: Reward the player with more information for getting each stage right. Use all tools at your disposal to convey it. Notes, chatter, objects, dialogue, set pieces, physics engine. Some cues are more showy, less telly. A coconut that drops when disturbances happen is better than a sign saying ‘beware of coconuts dropping’. Make interactions fun to play with to encourage experimentation. Coconuts only drop in Bangkok when you fire into a cluster. This brings guards and bloodshed. That doesn’t encourage experimentation. What if there’s a bellboy with a trolly that can crash into the tree…? Overacting is fine if it helps get the message across. Hitman is slapstick Christie anyway, don’t go for subtle just because a writer thinks he’s Dostoyevsky. Use the environment: Setting and context can make solutions a lot more obvious and make the player use real life knowledge. People need to shout in clubs or go outside if they have to take a phone call. Stepping on LEGOs hurts disproportionately if you’re barefoot. A school yard is more easily traversed when class is on. It makes things easier while making the player feel smarter. … in the big things and the little things. Need a book? Check the library, not the kitchen. The more logical things are, the less you need heavyhanded dialogue cues. Save those for telling me about the spork collection. 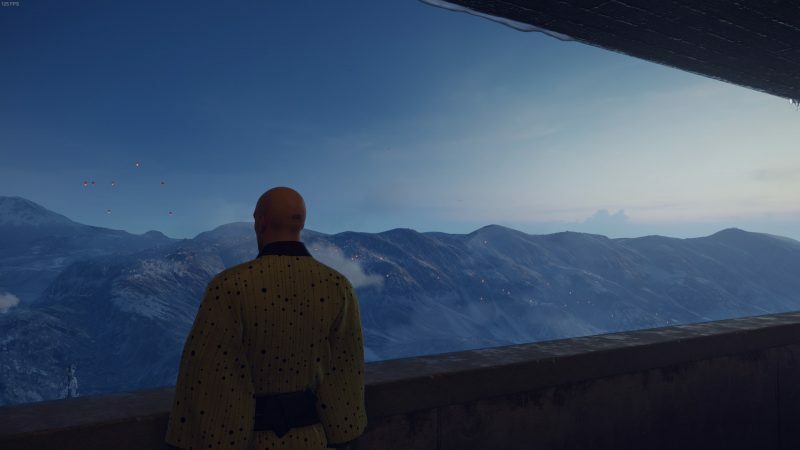 Hopefully, Hitman 2 will continue the good work that IO started with Season 1. * On a side note: The fact that Sorder, the man about of go under the knife, is the killer of the surgeon’s father is classic tragic inevitability. Think about just how improbable Oedipus ending up hitting his dad and hitting on his mom is and you’ve got the idea. Nevertheless it will obviously happen because of tragic inevitability. See also: Million-to-one chance succeeds nine times out of ten. This is the stuff of high drama but whoever wrote it failed to take into account the fact that Hitman is not a great vehicle for high drama. Melodrama at best and silly pratfall comedy mostly.